What are the amendments seeking to change the course of Brexit? 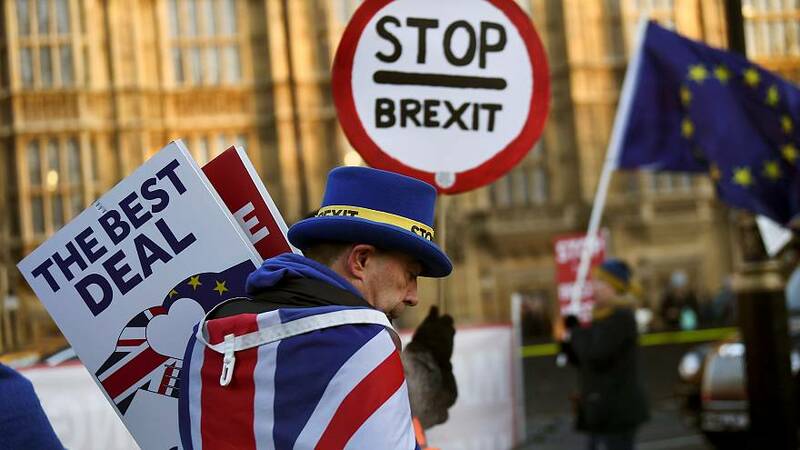 British members of parliament on Tuesday voted on seven amendments to Prime Minister Theresa May's Brexit deal. Following the massive defeat inflicted by MPs earlier this month over the Withdrawal Agreement and the Political Declaration on future UK-EU ties, the government has been forced to put forward a motion on what it plans to do next. The amendments sought in various ways to exert control over Brexit. The UK is due to leave the EU on March 29. Of the seven amendments that SpeakerJohn Bercow decided would go forward for further consideration, two were passed by MPs, including one that urged May to return to Brussels to secure a new deal without the controversial backstop, designed to ensure a hard border could never appear on the island of Ireland. The two that passed were non-binding and therefore have no legal power, but they do show the will of Parliament. How did the vote unfold? Theresa May mentioned the amendments put forward by Grieve and Cooper early on in her address on Tuesday afternoon, calling them "Deeply misguided and not a responsible course of action", but added that she did not doubt their sincerity. After that, May warned against the motion put by Jeremy Corbyn. "His amendment calls for legislation for a public vote but we still don’t know whether he would use it or what the question would be," she remarked. What followed was a considered attack. "It’s surely time for him to step up to the responsibility of being leader of the opposition and finally sit down with me and talk about how we can secure support in this house for a deal. He’s been willing to sit down with Hamas, Hezbollah and the IRA without pre-conditions, it’s time he did something in our national interest not against it." "The obstacle to a solution is the prime minister. She's refusing to accept the clearly stated will of this house which has... decisively defeated her deal." What are the amendments that passed? Some Conservative Brexiteers tabled amendments designed to toughen the UK’s stance on the Irish backstop — the device contained within the Withdrawal Agreement to guarantee no hard border between Ireland and Northern Ireland, and which involves the UK remaining in a “single customs territory” with the EU. The chair of the Conservative backbench 1922 Committee, Sir Graham Brady, was behind an amendment passed by MPs to replace the backstop with “alternative arrangements” and to support the Withdrawal Agreement “subject to this change”. The government gave its backing to the move, which was seen as an attempt to win over many Tory Brexiteers and Northern Ireland unionists from the DUP, which props up May’s government. It’s thought that if parliament gives clear backing to an alternative path, this could increase pressure on the EU to look at the issue again. Sir Graham suggested in a BBC interview that the Withdrawal Agreement might not necessarily have to be re-opened, and that the change could be part of a “legally binding codicil” attached to the accord. Several Irish ministers have insisted that the mechanism aimed at preventing a hard border is a vital part of the divorce deal – which was painstakingly negotiated over two years and was agreed by the EU27 and British governments – and cannot be changed or removed. MPs passed an amendment tabled by Tory MP Dame Caroline Spelman and Labour MP Jack Dromey, which rules out a no-deal Brexit.